Celebrate your Scottish heritage and experience the sound of the full pipe band, organ and orchestral instruments performing traditional Scottish and Irish tunes, and hymns that are especially heard at a Kirkin’ O’ the Tartans ceremonial celebration. 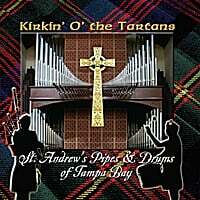 Although St. Andrew’s Pipes & Drums of Tampa Bay is not a competition pipe band, they are very proud to include every band member on this recording and not just a select few. You will certainly enjoy the natural, “huge pipe band sound,” as well as the organ and orchestra, all recorded for your enjoyment.